Picture Communication Tool: Home Page. 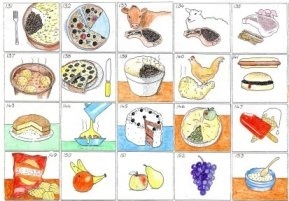 The Picture Communication Tool comprises sets of drawings that can be used with people whose first language is not English, or who are unable to communicate verbally. It cannot replace the need for interpreters but can be particularly useful for day to day activities within a medical setting. The drawings can be used to reinforce what has been explained to patients. They can be kept in the possession of a patient on the ward, so he/she can make their needs understood. In some instances, it may be helpful for the staff to have them, for instance the menu cards can be useful for the staff serving meals. You may want to get the drawings laminated so they can be re-used. The drawings are free to download, and are ready for printing. If you find them useful, please pass the website details to others. To request further drawings, or to comment on the website, go to our feedback page. We gladly accept donations so that we may continue to commission more drawings. We would also welcome corporate sponsorship.